Please join me in welcoming Elisa Wilson as a guest blogger today as she gives you a glimpse into her life as a pattern designer. Share your favourite beginner’s quilting tip for a chance to win a free pattern and template of your choice. Me: "Yes, I have a business. 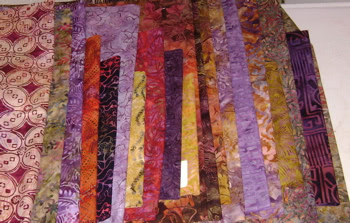 I design quilts and produce patterns and acrylic templates for quilters." Them: Blank stare, long pause. "Oh, you make quilts." Me: "No, I make patterns and sell them to quilters who make the quilts." Me: "Well, I sell mostly to quilt shops across the US and to distributors who sell to quilt shops." Then another person walks up and Them introduces me: "This lady makes quilts." Me: Sigh. "Yes, I make quilts." 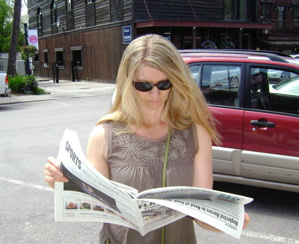 For a pattern designer, life revolves around market (it is a BIG deal for us). 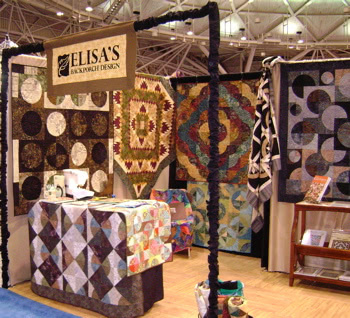 International Quilt Market is held twice a year. In the spring it moves around to different locations and in the fall it is always in Houston. At market you will find many different pattern designers, fabric companies, publishers of magazines and quilt books, thread companies, sewing machine manufacturers and much more. Market is about what is NEW. It is your chance to show everyone your newest creations. Immediately after market is over, you have to start on the new NEW and have it ready in time for the next market. So what do I really do all day? After my breakfast and morning workout I am on the computer. Computer work takes up the majority of my day. I am sending emails, posting blogs, marketing, taking online classes, designing, writing patterns and coordinating with graphic designers, printers and shop owners. Some days I even get to sew! First, I receive fabric from one of the fabric companies I work with. Then I sort through the fabric. This time there are about 30 different colors. Immediately I pull out any fabric that does not appeal to me. Fortunately there are only about 6 I do not like in this bunch. The rest definitely speak to me. Next I divide the fabric into colors. I make piles of colors that seem to be the same (greens in one pile, yellows in another, etc.). Then I re-divide the fabric into lights, mediums, and darks. I re-arrange it many times. I am handling the fabric, getting familiar with the colors and patterns. I usually let it sit on the dining room table and look at it during the day. Depending upon the deadline it can sit there for a few days or a few weeks. I begin to get a few ideas and then I go to my EQ (Electric Quilt) and play around with different blocks. Will this be an easy pattern or something more complicated? How many fabrics do I need to use? Does it have to be a certain size? Will I be producing the pattern or am I writing it for a fabric company? Playing on EQ can take days. Once I have a few ideas I begin to make test blocks. It is surprising that what looks good on EQ does not always translate to good in fabric. I sew a few test blocks, try a different fabric, arrange the blocks, go back to EQ, re-arrange the blocks. Then I write down how to make the blocks. Make a few more blocks to see if my instructions really make sense. A lot of back and forth goes on. More questions: Is it a good pattern? Is it different? Does it showcase the fabric? Who will this appeal to? Is it too boring or too challenging? Every quilt needs a name. My husband is super good at coming up with names. He writes down a bunch of names, just letting his imagination go and writing anything that comes to mind. We can get a good chuckle during the word play on names. After the quilt top is made I have to quilt and bind it. I love the quilting but dislike the binding. I then send it off to the photographer to get its picture taken for the pattern cover. While the photographer is working, I’m writing the pattern instructions. The pattern is proof read and tested. As soon as I get the quilt photo, the graphic designer and I create the pattern cover. The instructions and cover design are sent to the printer. Everything is printed and assembled into bags. Whew! That’s a lot of work. I usually have three or four patterns going on in different stages at one time. I work about 40 hours a week and I juggle a lot of hats. So my secret life is out. Are you surprised? How does it sound to you? Is it what you thought it would be? I would love to hear your comments and questions. I invite you to join me as I chronicle my life as as a designer and my adventures in the awesome Montana wilderness that is my home at Seams Sew Crazy or on Facebook. Visit my online shop, Elisa’s Backporch Design, to see my patterns, templates and video tutorials. I am offering a drawing for a free pattern and template of your choice. Anybody who makes a comment is entered. To enter the give-away: Leave a comment below sharing your favourite beginner’s quilting tip. Give-away ends September 8, 2010. Winner will be chosen randomly. This contest is now closed. Congrats to #61 Brigitte! Please continue to share your favourite quilting tips. These are awesome! I love love Elisa…she has great tips and tutorials on her site…and she really truly does read other’s blogs…I have all but her melon and 6.5″ templates….Even though she is a celebrity in her own right she is still very much a down to earth girl. The tip I hear over and over again is to measure twice and cut once, but most of all have fun creating. Thanks for sharing with us Elisa…. I love love Elisa….I have all but her melon and 6.5″ templates….Elisa has wonderful tips and tutorials on her site, go check them out heck post her site on your blog…..Elisa thanks for spending time with us and giving us a glimps into who you are….you are a celebrity in your own right but have remained such a down to earth kinda gal…..
My favroite tip is measure twice cut once but always remember to have fun creating….. The best thing I did when starting quilting was take a course in rotary cutting … sounds simple, but if you do it right you will never have problems with your blocks fitting together. So my tip is take a course from an experienced quilter! Thanks for the giveaway! My best tip for beginners is to carefully measure (twice if necessary) and cut once. Second is to check your 1/4″ seam allowance. Both of these tips will assure accurate piecing. I love your patterns and templates and have a few, so it was great seeing how they were born! I forwarded to the quilt group I am in, because it was so informative. I, too, ask my husband to name my quilts! Done is better than perfect. Perfection is the enemy of the good. My advice would be to sew a test block before cutting out the whole quilt. You can change fabric and/or fabric placement if you decide to before yards of fabric are cut. A great tip for beginner quilters is to not pre-wash the fabric. The sizing in the fabric as it comes of the bolt helps a beginner make accurate measurements and cuts and also the stiffer fabric is easier to position for sewing. 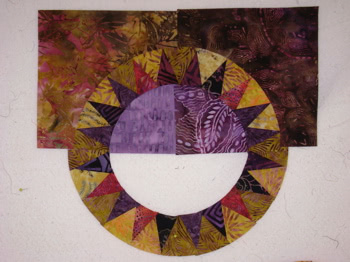 My first quilt teacher always made us rip out anything that was not precise. At the time I thought it ludicrous but realized in no time she was right. Nothing would fit if it was not precise. Perfection is the enemy of enjoyment. Don’t sew for perfection or deadlines. These two can ruin a good quilt and a good time. if you use leaders, and enders, in between all of your block pieces when sewing, you can actually be working on two or three projects at the same time…..something as simple as sewing two pieces of a nine patch together…or the “cut offs”… from 1/2 square triangles…I keep a stack of squares, and a little bin of triangles next to my machine at all times…..the use of leaders and enders also saves you from having “thread tails”, and I find it helps keep triangle points more pointed, when you have fabric already at the needle. hope that is “understandable”. My favorite tip for beginners. Measure, measure, measure. Measure twice, cut once. If you make a mistake in your measurements when cutting, it alters the entire block. Read the instructions carefully and measure twice before you cut. 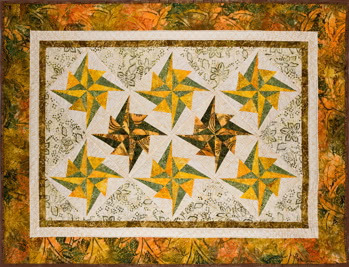 If you make a mistake in sewing, it can throw off all the blocks and in turn, the entire quilt. So, I would advise sewing a practice square and do it until you have a true !/4″ seam. Measure, measure, measure. My favorite tip? Start with washed, ironed, straightened fabric! Tip for newbies? Enjoy the process, and remember that there are no quilt police, so don’t sweat the quilting “Rules”. Mistakes will be made, you will learn from them, and your quilt blocks that don’t turn out just the way you wanted them can be made into pillow tops. LOL! My beginner’s tip is for matching seams … if needing to match seams on a four patch (or anything) be sure to place top seams pressed towards machine and bottom seams pressed away from the machine. Since the presser foot pushes and the feed dogs pull, the placement of your piece should securely seat the seams closely together, thereby matching the seam points. Two things….be aware that infinitely small sewing variances will add up to mismatched patterns, so take your time and sew accurately. And the secon tip is to become friends with your seam ripper. You cannot force fabric to fit. It will not work. You’ll need to think of ripping out and redoing as a natural part of the process. It’s worth it when you see the finished product. I think the best thing a beginner can do is to take a class. So much is shared in a class and you can get help and gain confidence. Then…take another class! Enjoy the process. Don’t be in a rush to hurry and get it done. Take your time and make each step as accurate as possible. Then when your quilt comes together at last, you will feel a great sense of accomplishment. I always purchase a little more fabric than is called for in the directions – reasoning that leftover fabric doesn’t go stale, hee hee, it can always be used for small projects or a crazy quilt. That’s my story and I’m sticking with it! It sounds like fun – but I will happily do your bindings. That’s one of my favourite parts of quilting. I now appreciate the time that goes into designing a quilt pattern. Thanks for your lovely work. Beginner’s Tip: Don’t throw away those scraps!! Sew strips of leftovers together as you create them and when you have finished your quilt you will have created a scrappy piece of material to make a pillow or cushion. It will match your project and help you avoid waste AND you won’t have to store it! I’m loving ALL of the comments – Thank you! I’m saving them to read over when I’m having a down day. And the GREAT tips! I have to agree with the tip on making a test block, before cutting ALL your fabric. And the one about buying extra fabric, I will have to obey that one :-) And to keep learning. And, well all of them, so many good things. I think the drawing is tomorrow. Stay tuned! Thank you for such a good interview. My favorite beginners tip is to make sure you sew a straight quarter inch seam so the block will fit together smoothly. Master the rulers and rotary cutter for precise and straight cutting and sew what YOU like. You’re doing it because it gives YOU pleasure. que interesante lo que haces,entretenido mundo de diseños y colores,soy nueva en todo ésto,tambien en computacion,cada dia descubro algo nuevo,aprendí mas o menos a volver a algun sitio de mi interes,espero visitarte otra vez,quiero ingresar a éste bello mundo del patchwork y quilting…. Google translate: very interesting what you do, entertaining world of designs and colors, I am new to all this, also in computation, every day I discover something new, I learned more or less back to some place of my interest, I hope to visit you again, take me to this beautiful world of patchwork and quilting …. I do all my cutting at the same time if possible. Having a son under the age of 3, makes for challenging time management. I find that if I can “kit” up fabrics into projects in one session, and then do the sewing in another, I will have a lot more progress. I also keep projects in satchels, so they are portable to grab at the door. It’s also easier to store when you can hang projects. My favorite beginner quilting tip is use good quality tools ie: scissors, cutting blade, thread etc. Thanks for offering this give-away! My advice, practice your 1/4″ sems. When doing the actual quilting…. Machingers (or something similar) this is a must have. My favorite beginning quilt tip is to be sure you press your seams carefully and often during the quilting process. It can make or break a beautiful quilt. Actually there are two that maybe “duhs” and already mentioned, but it doesn’t hurt to repeat them time and time again. The first one…NEVER mark quilting lines in ball point INK!! Yes, dear friends I HAVE seen this happen by a beginner on a guild fund raiser quilt of all things!! Second, and I just found out the other day at a quilt shop I was visiting that even after the 24+ years that I’ve been quilting the debate rages on over the “to wash or not to wash” question concerning newly bought fabric. I fall in on the “TO WASH” and have since I started quilting in 1986. Why? To reduce the risk of dye migration AFTER the quilt is made and may need to be washed for some reason. Believe it or not, even though I do pre-wash my fabric I have on very rare occasion still had this happen. The other reason is for the shrinkage. Once everything is washed and dried it should have already “shrunk” as much as it’s going to and if the quilt need to be washed there won’t be any puckering and buckling. The quilt shop owner I talked to the other day learned her lesson when she uses a TOP NAME fabric and after washing the quilt, one row shrunk about 2 – 3 inches compared to the other fabrics. OUCH!! My advice for a beginner is to have fun with the quilting process and to explore all the possibilities there is to quilting. My best tip is to buy the “stuff” recommended in the beginner books… 1/4″ & walking feet for your machine, rotary cutter, 24×6 ruler & the biggest cutting mat available are the minimum. I cheaped out on the cutter, ruler & mat… and paid for it later when I had to get new ones fairly quickly! Also, Best Press is the most wonderful non-drinkable liquid known to quilters. Buy it. Use it. My#1 tip is to PIN-PIN-PIN! Make sure those seams ‘nest’ together. Master the 1/4″ seam allowance and you’ll reduce your frustration level! My best tip for a newbie quilter is, when you are making your fist quilt… and looking for fabric, don’t let anyone talk you into any of your fabric choices… If you let a quiltstore employee choose your fabric it will never be your quilt and if someone says this would be perfect for your quilt and you hate the fabric… you will hate your quilt if you use it.Even if it breaks the rules for fabric choices… if you love it before you cut it, you will love your quilt when its done! Patience. It’s ok to mess up even though you really do not want to. This is how you will learn. Yep by messing up…. Each quilt gets better. I do not care how careful you are in cutting, measuring, sewing, etc you will mess up somewhere and fix it, rip it, sew it again. It’s ok.
And read directions a few times.